The financial crisis is taking its toll on the world's richest people, wiping 332 names off Forbes magazine's "rich list" of world billionaires. Just 793 people can now lay claim to a place on the list, but on average they have lost 23% of their wealth. The stock market collapse helped Microsoft founder Bill Gates regain the top spot, despite his wealth declining $18bn (£13.06bn) to $40bn. He ousted investor Warren Buffet, whose fortune declined by $25bn to $37bn. 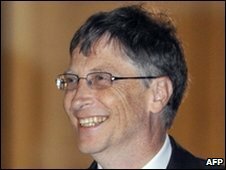 In 2008, Mr Buffet had managed to end Bill Gates' 13-year reign at the top as shares in his firm Berkshire Hathaway surged to a record of $150,000 per share just before Forbes formulated its 2008 ultra-rich list. However, the financial crisis has since taken its toll on Berkshire Hathaway, with its share value sinking 50% over the past 12 months. Indian businessman Anil Ambani experienced the biggest reversal of fortunes, slipping to number 34 on the list from number six last year, as his net worth sank by $31.9bn to $10.1bn. The declining health of the world economy meant that to make the top 20 on the Forbes list this year a net worth of just $14bn was needed - compared with $21bn in 2008. And in the past year, only 44 people on the list managed to increase their fortunes, compared with 656 who lost money. Mayor of New York Michael Bloomberg was the only member of the top 20 who managed to increase his net worth. His wealth rose by $4.5bn after a re-evaluation of his financial data firm Bloomberg LP. But the credit crunch did prove to be a boon for some names on the rich list, with nine out of the top 20 boosting their fortunes from discount retailing. Japan's Tadashi Yanai, founder of budget retailer Uniqlo, was one of the few newcomers to the 2009 list entering it at number 76 with a net worth of $6bn. Meanwhile German Karl Albrecht moved up from number 10 to number six as his supermarket chain Aldi cashed in on its cut price credentials. His rise in position came despite the fact that Mr Albrecht's net worth in absolute terms declined to $21.5bn from $27bn last year. In the regional stakes, countries like India and Russia lost ground this year to the US, which reasserted its dominance over the world's wealthy elite. The three richest men in India all saw their fortunes plummet by more than half, while Russian billionaires lost a total of $369bn between them. US citizens now lay claim to 10 of the top 20 spots - up from four last year - while the US is also the country with the most billionaires. As a result New York has also toppled Moscow as home to the most names on the rich list with 55 billionaires. The Russian capital itself has slipped to third place, with 27 members on the list, while London has edged into second place with 28 billionaires.